VOA – Women’s rights activists who have been calling for Tehran to end a ban on Iranian women attending men’s football matches have taken their campaign to the home of football’s world governing body, FIFA. 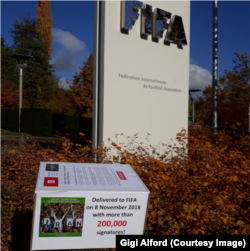 A box displaying a petition against Iran’s stadium ban on women is seen outside the headquarters of FIFA in Zurich, Nov. 8, 2018. More than 201,000 people around the world had signed the petition on the change.org website as of that date.